The trial over the Justice Department's lawsuit to block AT&T's purchase of Time Warner, which some observers had called the antitrust case of the century, ended Monday. But the two companies, and the many other people watching the case, will likely have to wait more than a month to find out the outcome. Judge Richard Leon, who presided over the seven-week bench trial, said that he plans to issue his ruling on June 12 but left open the possibility that a ruling could come sooner. A June 12 ruling will fall just nine days before the June 21 merger deadline between the two companies, at which point either side could walk away from the deal. In the last few minutes of his 75-minute long closing statement, the government's lead attorney, Craig Conrath, said the Justice Department prefers structural remedies to the deal, including "partial divestures." 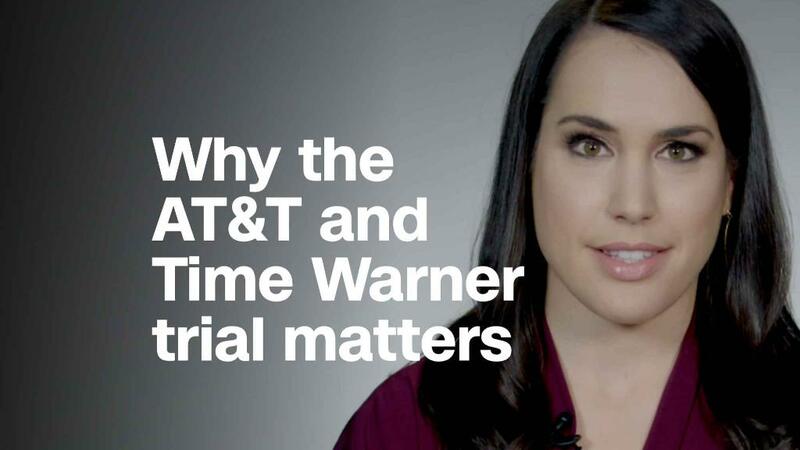 Should the merger be approved, he argued, AT&T should be forced to sell a portion of Time Warner such as the Turner Networks, which include CNN, TNT and TBS. The Turner Networks' value to rival distributors is a major sticking point in the Justice Department's lawsuit, which alleges that AT&T would be able threaten to withhold Turner content during negotiations with distributors in order to raise prices and lure customers away from rivals. Conrath noted that the remedy offers were "per the court's direction." A source with knowledge of the situation told CNN that Leon has asked both sides to include five pages of remedies in their post-trial briefs, due later this week. Conrath told Leon that the $85 billion deal would have a "massive impact on the structure of the pay-TV industry" and that the newly merged company would have "both the incentive and ability to lessen competition." Under antitrust law, Conrath argued that the government did not necessarily need to accurately predict the specific amount of harm imposed on consumers, only that there is a possibility of it happening. Conrath summarized the findings of the government's star witness, an economist who used a model that determined pay TV consumers would experience a price increase of around 45 cents per month per subscriber after the deal went through. Conrath said Shapiro was being conservative in his estimates and gave a range because the "real world is messy." Conrath also repeatedly brought up the 2011 merger between Comcast and NBCUniversal, warning that if AT&T merged with Time Warner there would be two huge vertically integrated companies that could coordinate to harm new competitors. What's notable though is that in the Comcast case, the Justice Department settled with the companies instead of suing, and agreed to behavioral remedies that expire this year -- and it was Leon who presided over that case as well. Facebook, Apple, Amazon, Netflix and Google are not threats to AT&T in the same way the company claims, Conrath said, calling them "tangential" to AT&T's business. "The fact that AT&T wants to compete in some other market, that doesn't give them a free pass to reduce competition in the pay-TV market," he said. AT&T and Time Warner lead attorney Dan Petrocelli slammed the government's case, saying it's "thin, tenuous" and a "house of cards." "This is a case of theories in search of facts," he said, telling Leon that the trial "has exposed serious questions about the credibility of the government's entire presentation." Petrocelli said that the analysis by the government's expert economist was flawed because it did not incorporate current FCC rules, current long term contracts Turner has with distributors, or the arbitration agreement Turner has offered distributors, which promises to avoid blackouts in the event of a contract dispute and to settle the disputes with an independent arbitrator. He said the theory that Time Warner would go dark on a distributor is "absurd" because any possible subscriber gains AT&T would win by virtue of customers leaving a competitor for AT&T would be overshadowed by the "catastrophic" amount of money Time Warner would lose in advertising revenue and distribution fees. Petrocelli also questioned several of Shapiro's data inputs, noting that adjusting for just a few of them would completely change the resulting cost per consumer. In fact, Petrocelli said, the merger could actually save consumers $500 million a year due to efficiencies and new advertising technology, which could ultimately lower costs for consumers. Leon interrupted Petrocelli to ask whether that would "create more competition in the marketplace." Petrocelli said it would, since other providers would have to lower their prices to keep up. Leon ended the trial by complimenting both parties for a "hard fought case" and "litigating this case at such speed."